A Deal With The Devil Anchorage Brewing Company How much did you pay? When Firestone Walker first came to New Jersey, one of their first offerings was their 13th Anniversary Ale. I had sticker shock at the $20 price tag and vowed that there was no way I would pay $20 for a single bottle of beer. Well, I passed on that anniversary ale but just a few years later, I found myself buying two bottles of A Deal With The Devil Anchorage Brewing Company for $35 each. I couldn’t believe I was doing it…but I had to have it. The second leg of my story is the reference to the deal with the devil and the connection to blues guitarist Robert Leroy Johnson (Rock and Roll Hall of Fame – 1986). Although the details of Johnson’s death are disputed, it is widely held that he was poisoned at the age of 27. He is prominently mentioned as a member of the famed “27 club” — named for musicians that died tragically at the age of 27 including Kurt Cobain, Jim Morrison, Jimi Hendrix, Brian Wilson, Janis Joplin and Amy Winehouse. What makes Johnson so interesting is the legend of his rise to fame. According to this legend, Johnson brought his guitar to the crossroads at midnight and sold his soul to the Devil. In exchange for his soul, Johnson would create blues that would make him famous. You might remember the movie “The Crossroads”; the story of a young musician’s search for Robert Johnson’s 30th (and unpublished) song. However, Johnson’s fame came long after his death as he would have been 50 when his fame skyrocketed in 1961. Massively sweet and above all, filled with caramel flavor. The mouthfeel is like nectar and the barrel influence is ripe with underlying dark fruit. A Deal with the Devil Anchorage Brewing is by far the best barley wine I have had. In conclusion, worth every penny for 96 points. Confused about terms used in this article? Check out my Glossary . When I first started this website in 2011, the craft beer world was a whole lot smaller. There were fewer than 2,000 breweries in operation compared to the nearly 6,000 reported in 2017. There was no Trillium, no Tree House and no Other Half. My aim was to find the beer widely considered the best beer in America. Of course, that task seems impossible today as the landscape keeps shifting. Before I started this website, I quickly realized how naive I was about the availablity of what was considered the best in America. You may recall my story of when I asked about buying a Dark Lord at my neighborhood beer store. I realized that getting to try these limited release beer would need some travel, trades and some patience. Early on, I created a bucket list of sorts and I’m happy to say that I crossed off a number of beers off one of my early lists. I was able to cross this off my list as part of a whirlwind trip to the brewery on October 11th. I’ll give you more details on my trip in a later post. 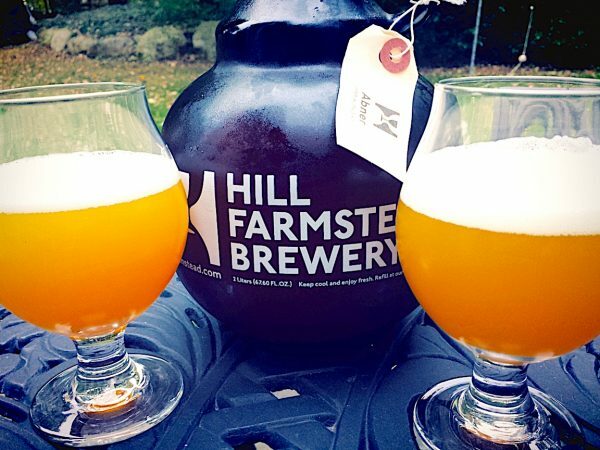 As far as Hill Farmstead Abner, I get massive fleshy orange and orange rind that weaves itself around some mild but noticeable boozy ethers. As you’d expect, there is that wonderful Hill Farmstead balance and polish. A true work of art, 97 points. 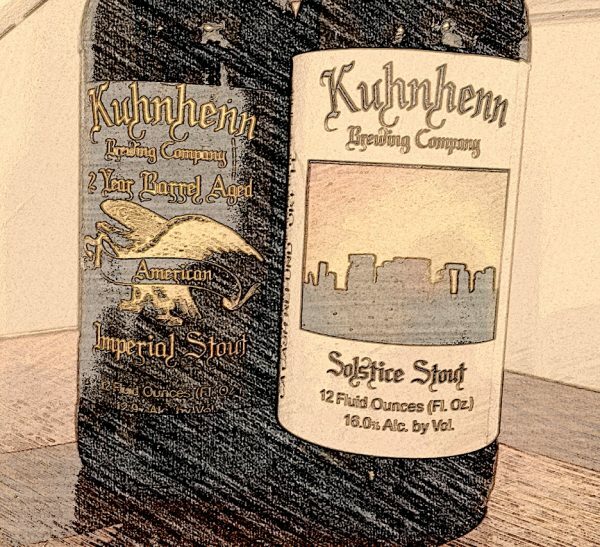 Solstice Stout, Kuhnhenn Brewing Company Also...Bourbon Barrel Aged American Stout and some talk of druids. Early man lived by the cycle of the seasons. They marked time through the position of the sun and other celestial bodies. Stone circles like Stonehenge acted as seasonal clocks marking the positions of the sun on days of significance. The summer and winter solstice were particularly important because it signaled the beginning of the ascent or descent of daylight hours. The solstice was celebrated by pagan cultures for centuries. These celebrations are often connected to a mysterious group known as druids. Druids were said to be Celts from areas of what is modern day France and Great Britain. They were thought to be the communal repository of the wisdoms of the age. They were philosophers, teachers, priests and they were present throughout Europe. However, most of what we know about druids is very clouded. Julius Caeser noted that the druids preferred oral teachings versus written teachings so, it may be that we may never know more than we do today. While druids are often connected to Stonehenge, written records show the first evidence of druidism comes more than two-thousand years after the construction of the ancient site. After a couple thousand years of existence, druidism was ultimately overshadowed by Christianity and pretty much disappeared in about the 9th century. I recall reading that December 25th was chosen by early Christians as the date for Christmas in order to overshadow the pagan winter solstice celebrations. Solstice Stout is a blend of Kuhnhenn’s Fourth Dementia (4D) 96 points and Solar Eclipse (sorry haven’t had this one) that is further aged for three years. This is the 2014 release, so it was originally brewed and blended six years ago. While the name of this beer suggests a stout, this is more like a strong ale. The pour is cola brown and very still. I get massive flavors of molasses, raisin, cherry, fudge and sherry. A tad bit hot but not surprising for a whopping 16% ABV. Solstice Stout is absolutely delicious. 96 points. This stout is aged in used bourbon barrels for two years. This happens to be a bottle from 2014, so this stout was originally brewed more than five years ago. Not to worry as the ABV is a robust 12.9% and should have matured nicely. However, I would say we’re running out of time. Any of the advertised coffee flavor has disappeared. I get sherry, rich raisin, some damp wood. After five years, it’s still a tad boozy and astringent. Has some fudge and a very nice syrupy mouthfeel. Considering the pros and cons, I’ll still put Bourbon Barrel Aged American Imperial Stout at 92 points. Double Dry Hopped Summer Street, Trillium Brewing Donna Summer is from Boston...hmmm. Dry hopping is the practice of adding dry hops (or dried hop pellets) to cooled wort (or cooked beer). Most brewers allow these hop additions to sit in the wort for as many as five days. This process lends a fresh hop flavor and usually wonderful aromatics. Double dry-hopping is…you guessed it…doing it twice. This IPA features a secondary dry hopping with Simcoe hops. Probably a double shot of Simcoe since the website doesn’t mention if they used a second type of hop in the process. 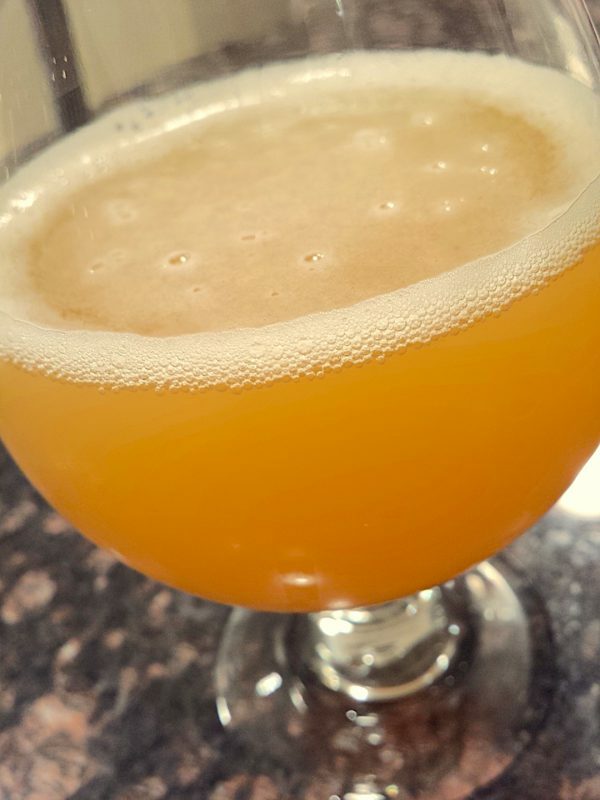 As you can see Double Dry Hopped Summer Street pours a wonderful hazy orange color. Flavor pops with tangerine, tart pear and grass. Soft edges, crisp finish, and a nice overall mouthfeel. Really nice offering from Trillium, 95 points. Trillium does name some of their beer after streets in Boston and many streets in Boston have been named for famous Bostonians. In this case, Summer Street is not named for Donna Summer. Sorry for that tease. I’ll offer up that Summer and Winter Street connect at Washington Street in Boston. So, Winter turns into Summer and vice-versa. How about a couple other Trillium “streets”?